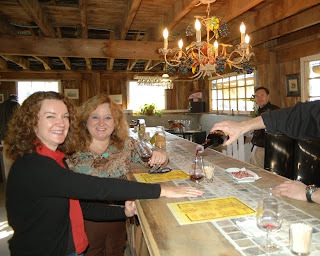 The Virginia Wine Dogs were the second customers through the door on November 27 as Delaplane Cellars officially opened for business (Munchkin confesses to spending a tad too long on her topknot that morning, but a girl's got to look her best at an opening). They were warmly greeted by Jim and Betsy Dolphin, proprietors of the classy new winery, which they began creating in July of 2007. The first thing that strikes one when entering the tasting room is the dramatic view. Floor-to-ceiling cathedral windows offer a panoramic sweep across vineyards (seven acres currently under vine) and picturesque farmland framed by the breathtaking Blue Ridge mountains. Betsy planned it that way. Indeed, Betsy's taste and attention to detail have created an environment that is sophisticated and inviting. Walls are painted soothing hues of gray and blue that complement the scenery outside and the room's clean architectural lines. An advocate of sustainable agriculture, when black walnut trees had to be removed from the property because they are toxic to grapes, Betsy had them milled down and used the rich dark wood for the bar and doors. 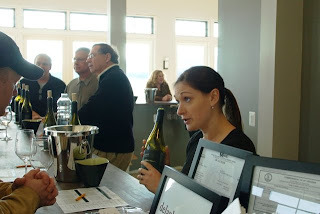 The staff, dressed in simple black, adds to Delaplane Cellar's sophisticated image, intended to appeal to GenB (for Baby Boom) wine connoisseurs. If tasting room manager Autumn looks familiar, you may have seen her at her former post at the Inn at Little Washington. 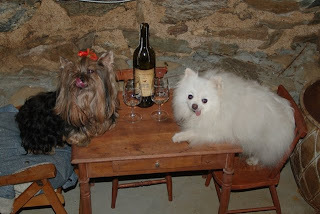 Munchkin and Pomeroy felt right at home as they settled in to try Jim's wines. 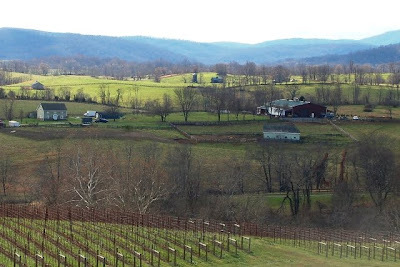 Jim has been tiptoing around the periphery of the Virginia wine industry for years. "The more I learned about it, the more interested I became," he explained. 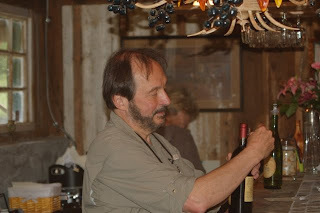 Jim took a winemaking course with Linden's Jim Law and began making wine as an amateur, much like Munchkin and Pomeroy. In fact, Munchkin first met Jim last year during her grape adventure gathering fruit from BOW for her own first homewinemaking attempt. Jim met with more success than his canine counterparts. 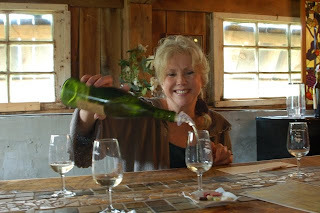 His three refreshing whites include a barrel-fermented Chardonney and two Viogniers, the one from Maggie's Vineyard near Breaux set Pomeroy's tail wagging. The reds had Munchkin begging for more. All three are from the superb 2007 Virginia crop. There is a CabFranc and a beautiful Bordeaux blend of Cabernet Sauvignon, Merlot, and Petiti Verdot, aptly named Left Bank. 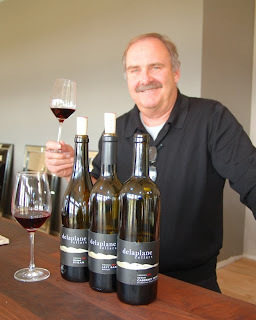 The star of the collection is the Syrah, which Jim has tagged as an up and coming grape in Virginia. Forget what you know about New Zealand's offerings, this wine is full bodied, rich and lush. "Delaplane... I think they've got it!" yipped Professor Pomeroy. "Luverly," Munchkin agreed. 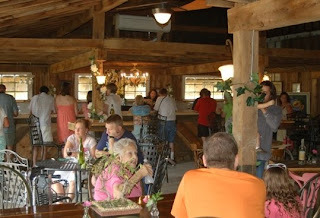 Coming off the mountain, Munchkin gave a bark of delight as she spied a new winery off John Marshall Highway (Rt. 55). Upon entering Aspen Dale, the Wine Dogs were transported back to Revolutionary War days. Guard-dog Roy kept a watchful eye on the door, expecting to see General Washington wandering into the charming barn-turned-tasting room for a drink at any moment. 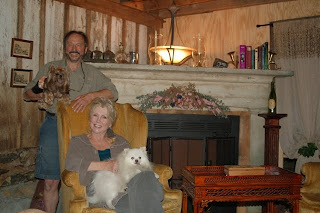 Claud and Shay McNeal Poulen bought the 50-acre property “for the history” 12 years ago. Aspendale is one of the oldest farms in Virginia, with the earliest part of the house and barns dating back to the 1780s. The wine-loving couple also began making wine for their own consumption. Soon, an idea took root. “It was her birthday,” Claud recalls. “We were at our favorite restaurant and I asked for a bottle of their best Carmenère from Chile.” The bottle that came out boasted an Aspen Dale label. 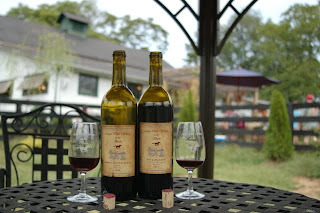 So amateur winemaker Shay (who is also a published author) turned professional, following in the footsteps of her ancestor who styled himself in his 1728 will – Thomas Parris, Vintner. A once drafty barn has been transformed into a warm and inviting refuge. 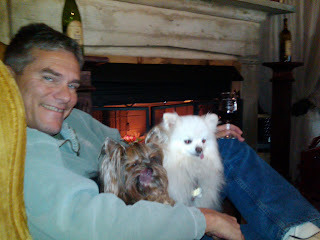 Pomeroy is particularly fond of relaxin g by the fireplace, as is his Dad, especially on chilly afternoons. Munchkin fell in love with the décor –a blend of colonial Virginia and country French (Claud is French Canadian) – declaring it the perfect place to bring her Mom’s college pal, whose daughter is studying in France. Vines were planted three years ago, dotting the picturesque landscape where Cromwell, a 7-month-old Great Dane, roams among the horses. The vines will “hang five,” spending two more years in the ground before grapes are harvested for wine. 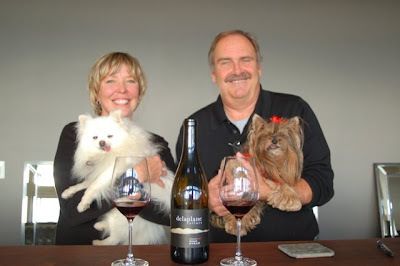 CabSauv also happens to be the name of what is perhaps Virginia’s first winery bird, who welcomed the Wine Dogs to Aspen Dale while Assistant Winemaker Daisy introduced them to Aspen Dale’s five wines. Food hound that she is, Munchkin was wild about the unique pairings, which included pheasant and bison. Pomeroy gave a “hats off” to Sarah’s Chapeau, a Vidal/Sauvignon Blanc blend named for Shay’s great grandmother, Sarah Parris, who loved hats. Sweeter palates will also appreciate the Rose and the crisp and refreshing Sanscerre-style Sauvignon Blanc. 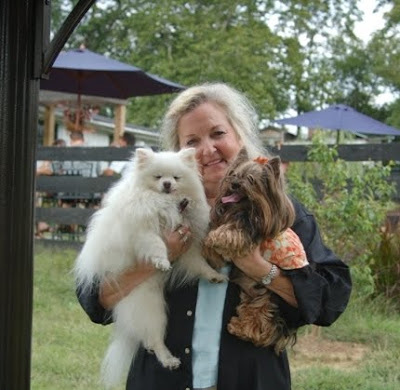 The Wine Dogs settled on the Parris County Blend, named for the ancestral plantation four miles away. This wonderful melding of Melot with a peppering of Cabernet Franc reflects the melding of wine and history throughout Aspen Dale. A Wine Dog shout out to furry fan Maxwell Keddie, a golden retriever they met at Aspen Dale. 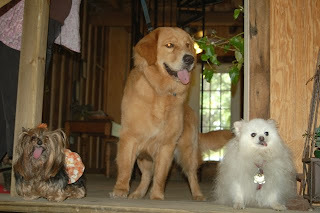 Max's Dad told Munchkin and Pomeroy: "I read the blog – that’s how we figure out which winery to visit." 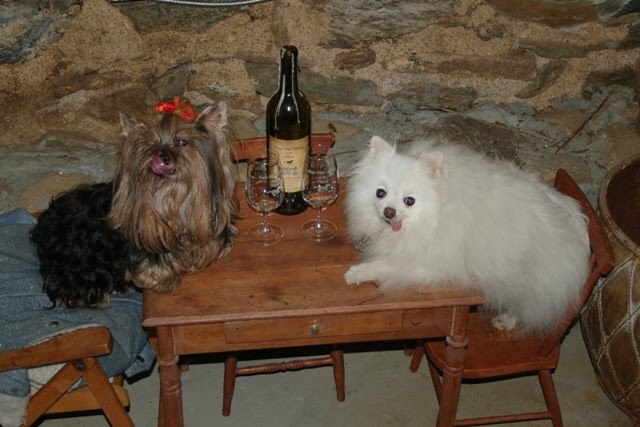 Munchkin and Pomeroy have taken a break from their usual wine tours to bark the vote for Bob McDonnell in Tuesday's election. 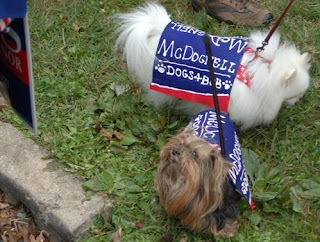 For a pair of wine-loving pups, Bob McDonnell is a natural choice for Governor. The former Attorney General (shown below with the Richmond SPCA's mascot, Nemo) received the 2008 National Humane Law Enforcement Award for his work to combat animal fighting in Virginia, and the enthusiastic endorsement of the Human Society in his bid to become the next Governor of Virginia. 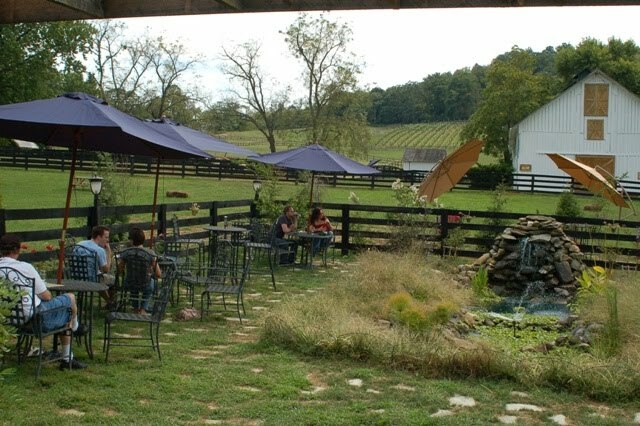 Bob also appreciates Virginia's farm wineries and has made promotion of the industry a key plank of his plan to bring jobs to the Commonwealth. 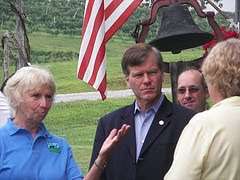 "Not only is it good for agriculture, we're up to almost 7th leading wine producer in America, but for tourism all those wine festivals, wine tour is a great way to get all those out of state dollars here to Virginia to see the wineries, spend money on hotels and something we need to promote signifigantly," McDonnell said during a visit to Blue Ridge Vineyard in August. And that's the word with the bark on it!